In the summer of 2013 an innocuous “for sale” ad appeared in the classified section of the Council Bluffs Daily Nonpareil: “Oak coffin on stand.” What the owner forgot to mention was the coffin came with the skeleton of the deceased included. 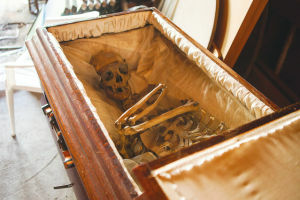 It seems that the Independent Order of Odd Fellows, a fraternal organization that makes anonymous donations to the poor, in Council Bluffs, Iowa was given the coffin and skeleton by a retiring local doctor who used the bones to teach anatomy. Made of oak, the coffin (and most likely the deceased) dates from the early 1900’s. The Odd Fellows accepted the donation and used it for many years in various secret rituals they conducted. This Odd Fellows chapter was founded in 1852. Unfortunately, in recent years the membership dwindled to just three members. As a result membership dues were minimal and insufficient to pay property taxes on the lodge hall. The city was threatening to seize the structure to repay this shortfall. Difficult times sometimes call for desperate measures. Thus the members voted to sell the antique coffin for $12,000 to pay off the Council Bluffs tax assessor. So far, so good. However, someone contacted the Council Bluffs Police department about the Odd Fellows offering a coffin and skeleton for sale. This resulted in a raid on the lodge hall and the seizure of the deceased. The skeleton was turned over to the Pottawattamie County Medical Examiner for identification and cause of death. Unable to solve the mystery, the bones were then sent to the Iowa State Medical Examiner’s lab for further study. As far as we know that is where they remain. Asked about the situation, lodge members said they were glad that someone else would take care of the remains. A spokesman said “You can’t just throw them in the trash or bury them.” Thankfully, the coffin is in the Odd Fellows possession and continues to be for sale. Any takers?